METRO TARGETS CLIFTON HILL LINE TODAY, AND WHERE TOMORROW? Recently I became aware that Metro has conjured up a plan to centralise control desks throughout the Clifton Hill station group following new contracts between the State Government, Public Transport Victoria and Metro Trains. This decision has been made without consultation with the RTBU and will have serious direct and indirect consequences to members. The direct consequences will be the loss of roughly 30 jobs at Reservoir station, Clifton Hill station, Eltham station and Heidelberg station. These jobs are full-time, well paid and a significant part of their community. Other consequences of the closures include a decrease in security and safety at stations along the line and a decrease in upskilling for staff. We also expect to see wider impacts on morale at the stations. The indirect consequences are just as serious and have implications for us all. 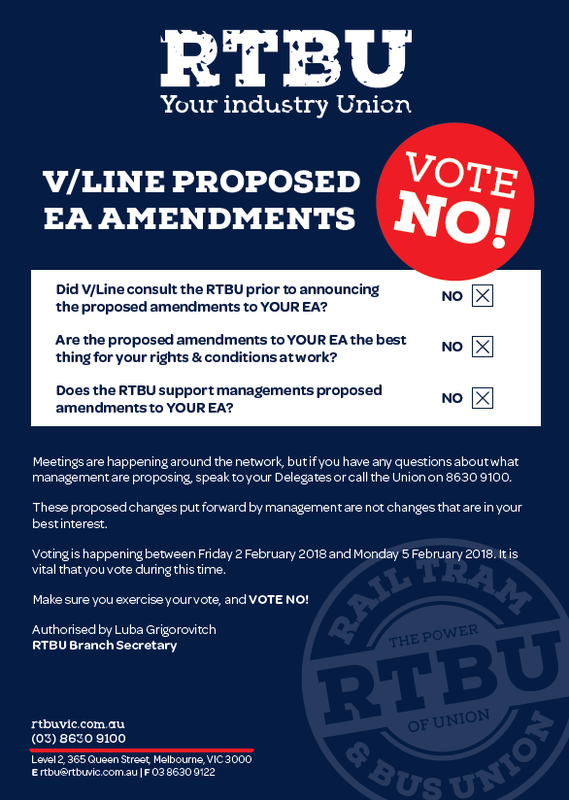 In making this decision without consultation, Metro has blatantly breached the Metro Trains Melbourne Rail Operations Agreement 2015–2019 (the Agreement). This constitutes a complete disregard for the industrial relations system and sets a dangerous precedent for future behaviour from Metro with regard to the law. 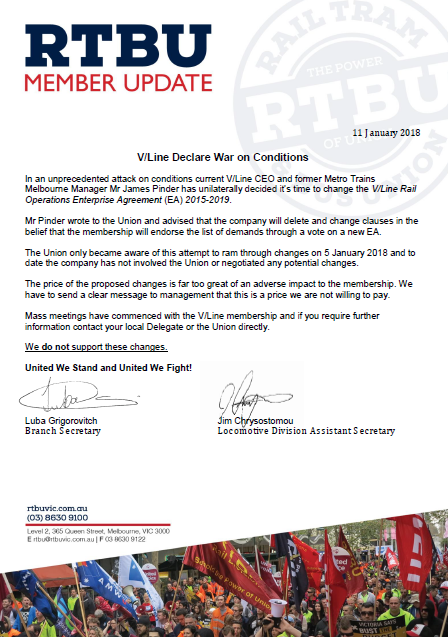 Metro cannot be allowed to unilaterally make major changes to our members employment. This is why we are fighting back and insisting that the laws and protections that we have in place be abided by. 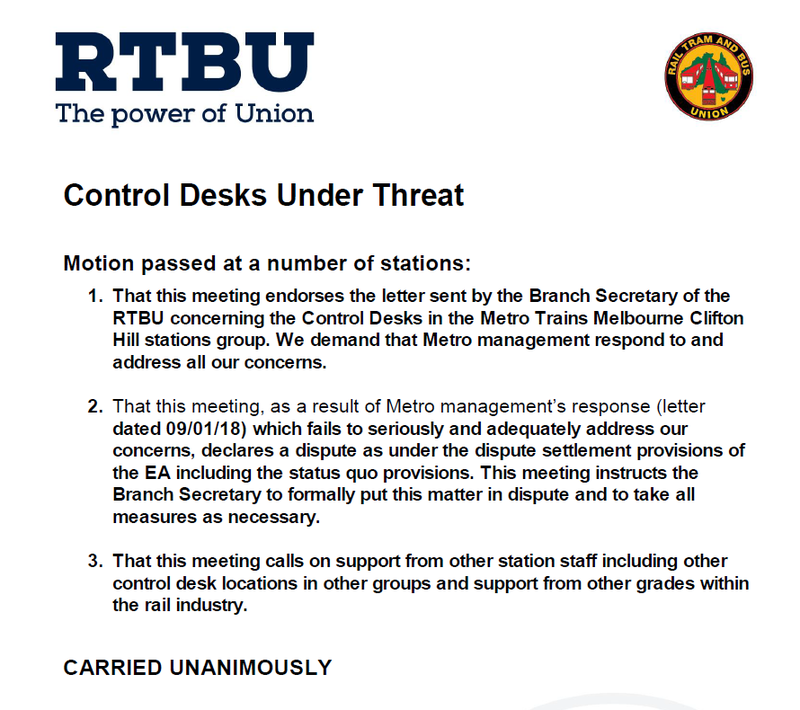 The RTBU has written to Metro notifying them that this issue is now formally in dispute. This means that they cannot progress any of their changes until the dispute is resolved. I have also written to the State Public Transport Minister pointing out that the State Government’s policy is to avoid job cuts and redundancies and that this situation makes a mockery of that commitment. I am told that the Minister is currently on leave but I have requested that she meet with me at her earliest available opportunity so that I can explain the serious consequences this situation has on our members. The Minister and Metro ought to be concerned about the welfare of our members who are reporting that they are stressed about their job security. However, if they choose to disregard the impact on people, we will call them out on their behavior loudly and publicly. Having visited Reservoir Station and Clifton Hill Station last week, with meetings scheduled at Eltham and Heidelberg Station this week I am pleased to see the membership active and ready for the fight which lies ahead. As per usual, this battle will not be an easy one to win, however the first step is remaining united in the fight. We must continue to defend our hard-won rights and conditions to ensure the future of the Rail industry remains strong. For too long, members of the RTBU have had to deal with substandard conditions at work when it comes to Health and Safety. Enough is enough. Today we are calling on members to inform the RTBU of issues you face on a daily basis. You deserve the right to feel safe at work, which is why I am pleased to announce that we will be launching the RTBU Health and Safety Campaign. We appreciate that you, deal with the travelling public on a daily basis, and we know it can be hard work. On top of this, too often management try to cut corners. This must stop. The health and safety of our members is of high concern to us and we endeavour to do all that’s possible to ensure that you feel safe at work. With your help, we will be tackling one issue at a time, so I urge you to put forward any stories, experiences or issues that you have so that we can begin tackling these issues. Your input is valued and we want to know what solutions you can offer to increase the Health and Safety in your workplace. To raise an issue or concern, please email safety@rtbuvic.com.au. Alternatively, you can call the union office on 8630 9100 or Hannah Scott on 0448 569 178. We are a loud and proud Union and we want our workers to feel safe at work, however we can only help combat an issue if we are informed about it. I look forward to working with members in finding solutions to a safer workplace.